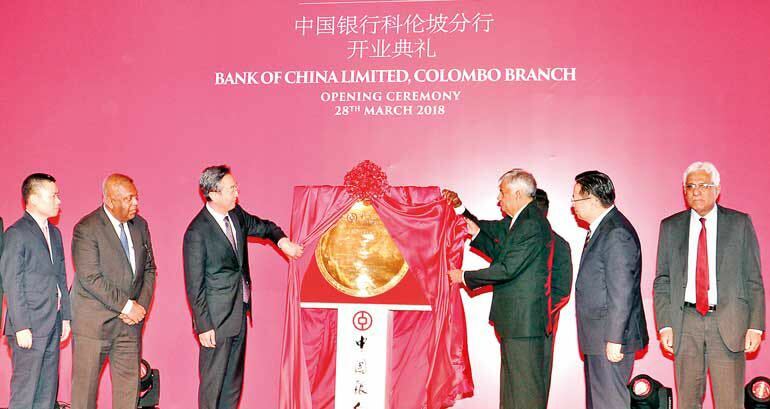 Colombo, March 29 (newsin.asia): The Sri Lankan Prime Minister, Ranil Wickremesinghe, has said that the Bank of China, which opened its branch here on Wednesday, will help the Sri Lankan economy link up with the world, namely, China’s Belt and Road Initiative (BRI); the vast Indian economy through the proposed Comprehensive Economic Partnership Agreement (CEPA); and the European market through the General System of Preferences- Plus (GSP-Plus). The Bank of China, which is currently the fourth largest bank in the world, is bound to reach the top of the banking order given China’s growing economic power and reach, will help Colombo establish itself as a Financial Hub of South Asia, the Lankan Prime Minister said. The US$ 1.4 billion Colombo Port City, built by a Chinese company, will essentially be a “Financial City” where persons from across the region and the globe can transact financial business and also park their funds. The Lankan Prime Minister said that Sri Lanka will be expanding its economic reach through a Free Trade Agreement with China and Singapore and also an Comprehensive Economic Partnership Agreement with India. Hailing China’s contribution to the development of infrastructure in Sri Lanka, Wickremesinghe said that Hambantota will be an industrial hub with roads linking it to other places in the island. The Governor of the Sri Lankan Central Bank, Dr.Indrajit Coomaraswamy, hailed the entry of the Bank of China as a “major landmark” in the history of the Sri Lankan economy. The bank, with its largest network of branches in China and other parts of the world, will not only help expand trade but help Small and Medium Enterprises (SMEs) grow by making available cheap credit. The bank will help Sri Lankan SMEs tie up with manufacturers overseas as part of international supply chains. The Chairman of the Bank of China, Wang Xiquan, said that the hundred year old institution now has 600 branches overseas and links with 1600 financial institutions across the world. The branch coming up in Colombo will be housed in the iconic Cargills building in the Fort. The Bank of China is part and parcel of the Belt and Road Initiative which covers 70% of the world’s population and 30% of the world’s GDP, Wang said. The Chinese Ambassador in Sri Lanka, Cheng Xueyuan, described Sri Lanka as a “time tested friend” of China and thanked Prime Minister Wickremesinghe for the support he had given to set up a branch in Colombo.